I’m kind of in love with the fact that they all have pictures, too. Is that weird? Probably. Most of them are desserts and some aren’t quite as exciting as I would hope for, but what can you expect when there are only 2 ingredients involved? I’m really curious how some of these end up tasting, too. Like the pizza dough one…. is it really going to taste like pizza dough or is it going to be only sort of like pizza dough but really gross instead? The white thin mints one is really curious, too. I’ve seen lots of creations online, no doubt, but this one is actually new to me! It’s created in a restaurant instead of being an at-home compilation. BJ’s Restaurant sells a variety of “pizookies” or “cookie pizzas.” One example is a chocolate cookie made with chunks of Ghiradelli chocolate, topped with a couple scoops of double chocolate ice cream (also with chunks of Ghiradelli). Another is Red Velvet Pizookie with hot red velvet cake topped with vanilla bean ice cream in its own deep dish. There’s also a standard chocolate chip variety, a strawberry shortcake style one, and a trio that includes a lovely looking white chocolate macadamia nut and peanut butter pizookie. But the king of the pizookies? 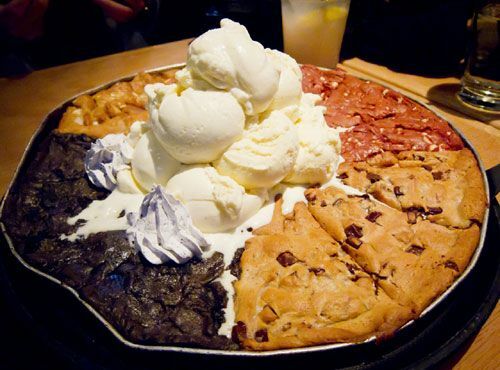 It’s the party platter that you see above which can actually vary because you can choose any four of their pizookie varieties and partner them up for one mega platter of cookie goodness. 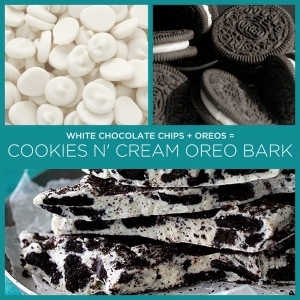 I can’t quite tell what the two top pizookies are in the above picture, but I don’t even care. I want them all! Also, I kind of wonder what the recommended serving size is for this….not because I would follow it, but because I’m sure I’d get weird looks if I ordered this at a table with only two people…. and I could take the cookie portion home with me, but that would be a waste of ice cream! 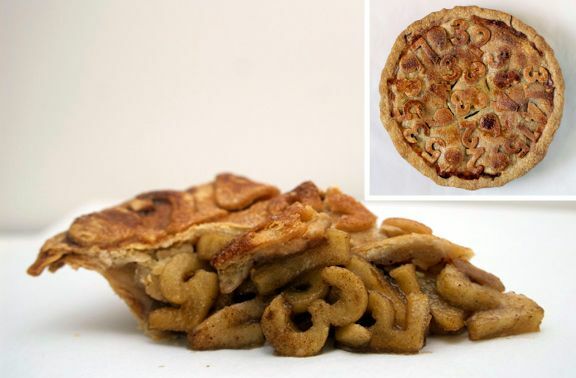 I have been around the interwebs for my fair share of “pi days”* and have seen a lot of awesome pies created for the day. I’ve even made my own pies on that day, because that’s what you’re supposed to do, right? But this one takes the cake (er, pie?) for the best pi-related one. It goes above and beyond just putting the pi numbers on top and instead, fills the center with pie shaped apple slices, too. How fun would that be to slice into after already being impressed that there are numbers on top and expecting a regular pie inside? *March 14 is considered “Pi Day” because the first 3 numbers of ‘pi’ are 3.14….which looks like the date “3-14” or “March 14.” Just wait for the celebration in a few years when it’s 3.1415….